AC Milan coach Gennaro Gattuso. AC MILAN HAVE announced the club’s under-performing players are to be taken on an intensive training camp following a shock loss at Verona. 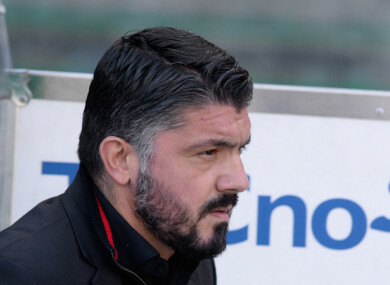 Gennaro Gattuso’s side were beaten 3-0 at the relegation-threatened side on Sunday, the Rossoneri having lost three of their last eight matches in all competitions. Gattuso is in temporary charge of Milan following the sacking of Vincenzo Montella but is already under pressure after failing to turn results around. “AC Milan announce that the team will go on a training retreat from tomorrow until further notice,” said a brief club statement. Milan became the first team to fail to beat Benevento in Serie A this season when a stoppage-time header from goalkeeper Alberto Brignoli earned the bottom side a 2-2 draw in Gattuso’s first game at the helm. The former Milan and Italy midfielder also oversaw a 2-0 loss to Rijeka in the Europa League before a league win against Bologna and a Coppa Italia victory over Verona hinted a corner had been turned. Milan’s next game is at home to Atalanta on Saturday, with Gian Piero Gasperini’s side seventh in the Serie A table – a place above Gattuso’s men. Email “After embarrassing 3-0 loss, AC Milan taken to training bootcamp”. Feedback on “After embarrassing 3-0 loss, AC Milan taken to training bootcamp”.